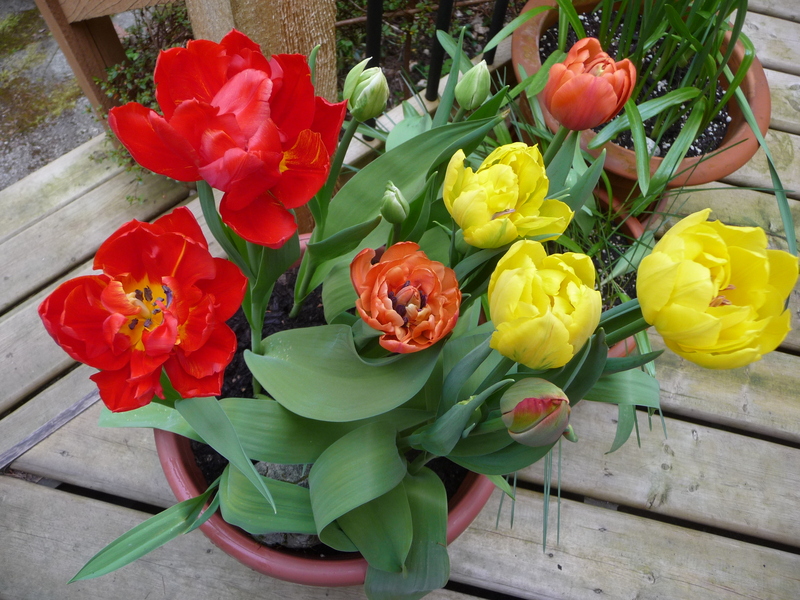 I can only grow tulips in pots on my decks. The deer inhale them otherwise, eating the succulent leaves as they emerge from the ground. Many years ago, when our dog Lily was still alive, deer never ventured near our house and I recall tulips in many areas of the garden then. Now they don’t even bother trying. Some days, looking out the window over the kitchen sink, I see deer on the patio, nosing around to see if there’s anything to eat. Roses? Lilies? What about a tendril of clematis? It might be time to bring home another dog. Yesterday I noticed the tulips in this pot beginning to open so I moved the pot into the light. It had been tucked against the east wall, under the shade of cotoneater. Within a couple of hours, the flowers had opened so beautifully that I caught my breath, coming up the stairs to see them. ~ by theresakishkan on April 25, 2013. This entry was posted on April 25, 2013 at 4:18 pm and is filed under Uncategorized.You can follow any responses to this entry through the RSS 2.0 feed.You can leave a response, or trackback from your own site.